Natural health manifests itself in the physical appearance of your horse or pony. A sleek coat, bright eyes and clean airways all demonstrate the effectiveness of the equines' immune system. Through the use of 9 active nutraceuticals, Immune Aid provides support to the normal immune system of the equine to deal with the presence of foreign materials that can be harmful to health and physical condition. These antagonists are found in feeds and the environment and trigger the natural self-defence mechanism of the equine to neutralise any possible harmful effects. Helps maintain the equines’ natural immune response to the presence of environmental and/or feed derived foreign materials, which can be harmful to both health and physical condition. Contains 9 active nutraceuticals, including: concentrated yeast and oat derived oligosaccharides, glutamine, hemp oil derived omega 3 fatty acids, microscopic toxin binders and a blend of galactolipid emulsifiers, tocotrienol antioxidants, beta glucans and phospholipids. Through the addition of the following specific active ingredients, Immune Aid provides a complementary nutritional support for all horses and ponies. Omega 3 Fatty Acids Hemp oil is probably the best source of Omega 3 Fatty Acids found in the plant world. This unique combination enables the horse to produce other essential Omega 3 fats called EPA & DHA, both of which are normally only found in fish oils, but are crucial for the health, fertility, condition and performance of the animal. MT.X+ Microscopic Binder MT.X+ is a blend of microscopic absorbent compounds that aid the natural expulsion of antagonists found in feed and the environment. 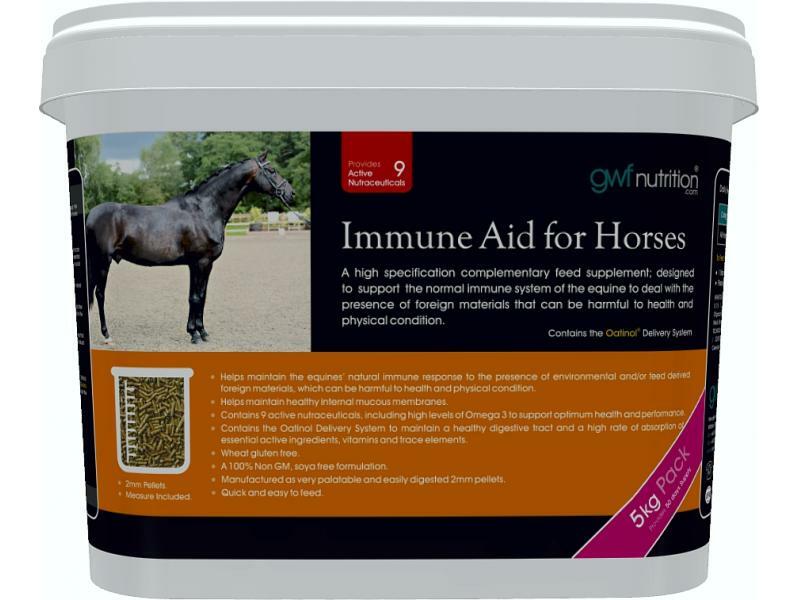 There are currently no questions for Gwf Nutrition Immune Aid For Horses - be the first to ask one!